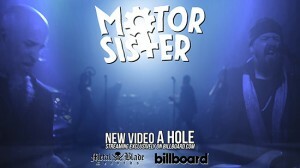 MOTOR SISTER premiere video for ‘A Hole’ on Billboard.com. The day has finally arrived and the debut from MOTOR SISTER, “Ride” is out now on Metal Blade Records! The album can be ordered at metalblade.com/motorsister. Coinciding with the album’s release the band is pleased to unveil their new video for the track “A Hole”. The video is receiving its exclusive premiere courtesy of Billboard.com. Check out the video directed by Jack Bennett and an exclusive interview with Scott Ian HERE. If you can’t watch the video in your territory, please use this vimeo link. 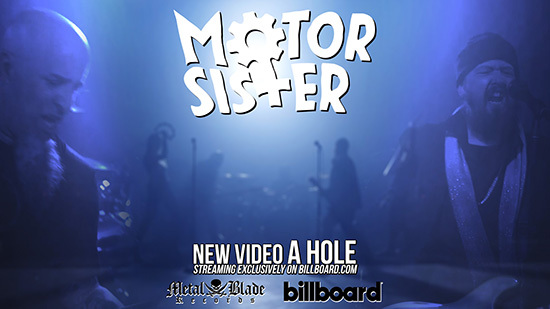 “MOTOR SISTER is a group of musicians whose collective musical pedigrees speak for themselves.” Mother Superior founder, guitarist, and vocalist Jim Wilson fronts the band, with Anthrax’s Scott Ian on guitar, Pearl Aday on backing vocals, Joey Vera on bass, and John Tempesta on drums. The group was originally assembled to jam for Scott Ian’s fiftieth birthday party. Thanks to Scott’s wife Pearl Aday, who has been working on her solo career with Mother Superior front man Jim Wilson for years, all it took was a quick phone call and the stage was literally set for Scott’s dream gig. “I wanted to cherry-pick a set list of my favorite Mother Superior songs and get these guys together and have the concert at my house,” Ian says of the event that eventually led to an album. That album became known as MOTOR SISTER‘s “Ride”. The video for “Fork in the Road” which provides a rare glimpse into the recording of this Mother Superior favorite by MOTOR SISTER can be viewed HERE.